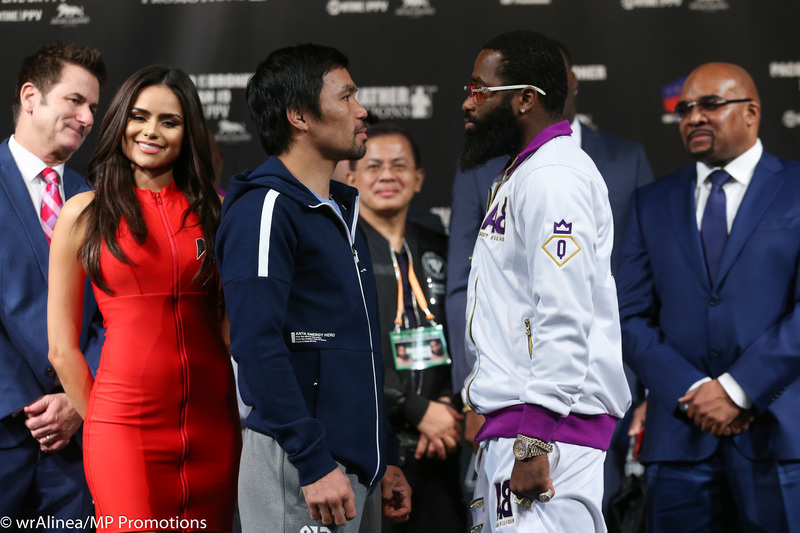 On Saturday night, hall of famer Manny Pacquiao will be making his debut under Al Haymon’s Premier Boxing Champions (PBC) banner when he faces off against Adrien Broner. This bout will take place at the MGM Grand Garden Arena in Las Vegas, Nevada and will be distributed live on PPV by Showtime. The co-main event of the night will be between Badou Jack and Marcus Browne for the WBA Interim Light heavyweight title. Two other title fights will also take place. The WBC Bantamweight Title will be on the line when Rau’shee Warren takes on Nordine Oubaali. The WBA Interim Featherweight Title will also be on the line when Jhack Tepora takes on Hugo Ruiz. Other fighters on the undercard include George Kambosos Jr., Rey Perez, Jayar Inson, Jonathan Steele, Genisis Libranza, and Carlos Buitrago. The co-main event of the evening has the potential to be a very competitive fight. Both Marcus Browne and Badou Jack are very solid boxers with strong amateur backgrounds. Browne was a National Police Athletic League Champion, a US Amateur Light Heavyweight Champion, and represented the United States in the 2012 Olympics. Jack was a multi time Swedish National Champion as an amateur and represented Gambia in the 2008 Olympics. Browne is seven years younger than Badou Jack, who at thirty five years old is nearing the end of his physical prime. Browne will also have about a half inch height advantage and a two and a half inch reach advantage over Jack. Browne has a slight edge in activity. He fought twice in 2018 and twice in 2017. Jack only fought once in 2018 and fought twice in 2017. They both have decent power but neither is known as a true knockout artist. Browne has sixteen stoppage victories on his record while Jack has thirteen. However, Browne has stopped three of his past four opponents while Jack has only stopped one of his past four opponents. Jack appears to have faced the better competition of the two as a professional, but fights in a lot of close matches. He has majority draws with Adonis Stevenson, James DeGale, and Marco Antonio Periban on his record. He has beaten the likes of Nathan Cleverly, Lucian Bute, George Groves, Anthony Dirrell, Farah Ennis, and Rogelio Medina. His lone loss was an upset TKO loss to Derek Edwards. Browne has never tasted defeat as a professional. His closest fight to date was a split decision win over Radivoje Kalajdzic. He has wins over Thomas Williams Jr., Sean Monaghan, Francy Ntetu, Lenin Castillo, Gabriel Campillo, Cornelius White, and Aaron Pryor Jr. This should be a close competitive fight, but the writer has to give a slight edge to Marcus Browne based on age, physical advantages such as reach and power, and more recent success and activity. Manny Pacquiao is a living legend, but he’s now forty years old and his time at or near the top is coming to an end. He’ll be facing Adrien Broner, a high level boxer who was once considered to be the next Floyd Mayweather Jr., but hasn’t been able to reach that level of fame or success…yet. Broner is still in the midst of his athletic prime at the age of twenty nine, while Pacquiao is no longer at his prime at the age of forty. Broner will only have a half an inch height advantage and about a two inch reach advantage over Pacquiao, which is actually a smaller advantage than what Pacquiao is accustomed to. Pacquiao, as most know, turned professional as a teenager and doesn’t have the deep amateur experience of most professionals. Broner was a two time National Silver Gloves Champion as an amateur. Pacquiao has thirty nine stoppage victories as a professional, but got his first TKO win in nine years when he beat Lucas Matthysse. Broner has twenty four stoppage victories. Pacquiao has defeated an impressive list of well known opponents. His wins include Lucas Matthysse, Jessie Vargas, Timothy Bradley Jr., Chris Algieri, Brandon Rios, Juan Manuel Marquez, Shane Mosley, Antonio Margarito, Joshua Clottey, Miguel Cotto, Ricky Hatton, Oscar De La Hoya, Marco Antonio Barrera, Erik Morales, and Lehlo Ledwaba. Many of his losses are either disputed, or were losses he avenged or beat the opponent earlier. His losses were to Jeff Horn (disputed), Floyd Mayweather Jr., Juan Manuel Marquez(beat twice), Timothy Bradley (disputed, avenged), Erik Morales (avenged), Rustico Torrecampo and Boonsai Sangsurat. Broner hasn’t defeated the type of named opponents that Pacquiao. His wins include Adrian Granados. Ashley Theophane, Khabib Allakhverdiev, John Molina Jr., Carlons Molina, Paul Malignaggi, Gavin Rees, Antonio DeMarco, Jason Litzau, and Daniel Ponce De Leon. His losses were to Marcos Maidana, Shawn Porter, and Mikey Garcia. Pacquiao’s lack of activity in the past two years is concerning. He’s only fought once in 2018 and once in 2017. However, Broner has only fought once in 2018 and doesn’t appear he’ll reach the potential many thought he once had. This is a bout that Pacquiao should win, and if he wins convincingly his popularity and hall of fame resume will only get bigger. The post Showtime PPV Boxing Preview: Pacquiao vs. Broner, Jack vs. Browne appeared first on BoxingInsider.com.